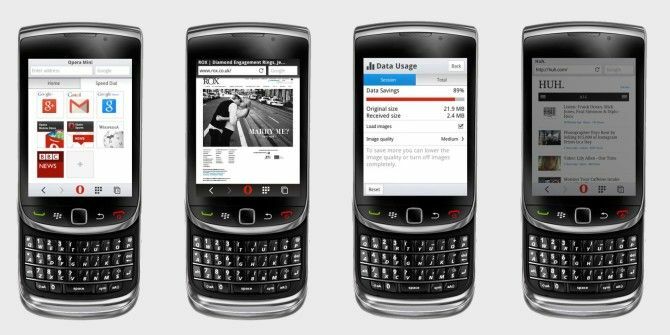 If you’re on an older device that runs Java, or if you use a non-OS10 BlackBerry phone, then Opera Mini is the best browser Optimize Your Mobile Browsing With The Opera Mini Browser Optimize Your Mobile Browsing With The Opera Mini Browser Read More you can have. And it’s just gotten a whole lot better with Opera Mini 8. The new version of Opera Mini comes with a private browsing mode so that you can use it to sign into a different account on a service or let a friend browse on your mobile. Unlike many other mobile browsers, Opera Mini 8 doesn’t open a new private browsing window; instead, you get just a new private browsing tab. It’s also got a new Night Mode which dims the effects of a bright screen and uses darker colours that are easier to read in low-light environments. When you need to use it, just head to Settings and activate it. You might not need this on BlackBerry since most of those phones adjust screen brightness to your surroundings with an ambient sensor, but this is what makes Opera Mini a great Java app for non-smartphones 5 Great J2ME Apps For Your Non-Smartphone 5 Great J2ME Apps For Your Non-Smartphone Are you not using a smartphone, but still want access to a few apps? It might be possible - if your phone can use J2ME, there's a wide variety of apps out there for your... Read More . Opera Mini 8 has also changed the Speed Dial, the default shortcut screen that provides quick access to your favourite sites. The new design is flatter, minimalistic and faster, Opera says. Finally, Opera Mini has improved the “savings report”, which monitors and adjusts how you save data, such as image quality. Of course, one of the best features of Opera Mini is that it automatically shrinks pages to save you data. With these new features, it’s among the best cool free apps for BlackBerry too. Download Opera Mini for your smartphone by visiting m.opera.com. Explore more about: BlackBerry, Java, Opera Mini. I tried opera browser and, in truth its not a better than blackberry OS 7 default browser. People use it for downloading however, the browser itself have lower ratings for HTML5 support that most sites are using today. I also dont see much of a difference in download speed on wifi but, a little on network. The android version is better. I'd love if Opera brought this to BlackBerry 10. I need a good alternative to the default browser on my Z10. I downloaded it for my java phone. Looks like a broken down version of uc browser. Night mode was available with uc for a very long time and opera took a pretty long time in adding this. Still not better when compared to uc's. Private browsing is a welcome addition. Best thing about opera is its clutter free interface but now that seems to be changing. Drop down list on the old one is better(now it looks like uc's menu). But anyway this change is a welcome one except the drop down list.